The Hino Blue Ribbon City Hybrid is a low-entry single-deck city bus built by Japanese company Hino Motors primarily for the domestic market. As part of the Hino Blue Ribbon family of buses, this bus is a built by J-Bus, a joint venture of Isuzu and Hino Motors. 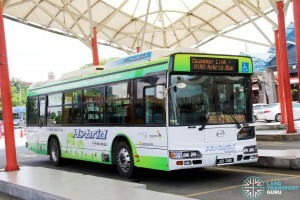 Under a passenger service trial, a Hino Blue Ribbon City Hybrid bus was trialled in Johor Bahru, Malaysia, by local bus company Causeway Link. Entering service in September 2017, the Hino Blue Ribbon City Hybrid is Malaysia’s first hybrid bus and was placed on six-month trial with the operator, which has ended in 2018. The Hino Blue Ribbon, in its diesel and hybrid models, primarily serve its domestic market of Japan with many urban bus operators using the model. In addition, an experimental hydrogen fuel cell variant was built. The Hino Blue Ribbon Hybrid Bus was first launched in January 2005, with its latest version launched in December 2015. The unit trialled in Johor Bahru, a Hino Hybrid HU8J, features a diesel engine (Euro III) paired with an automated manual transmission and an upgraded hybrid powertrain, and fitted with 90 kW permanent magnet AC motors. 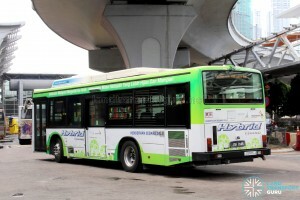 While the Hino Blue Ribbon Hybrid Bus is offered with the A05C-K1 4-cylinder engine which is compliant with Japan’s 2015 Diesel Emission Standards (similar to Euro VI emission standards, but slightly less stringent), the unit delivered to Malaysia is fitted with a Euro III compliant engine (model currently unknown). This is likely due to the lack of Ultra-low-sulfur diesel (ULSD) availability in Malaysia, which hampers the rollout of vehicles with higher emission standards (i.e. Euro IV and above) which require ULSD to achieve high emission ratings. 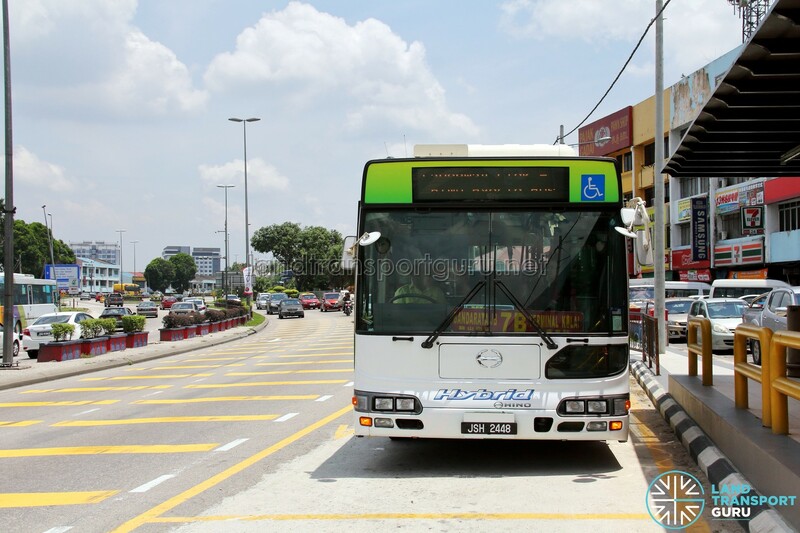 On 15 June 2017, a Memorandum of Understanding (MOU) between Mitsui, Medini Iskandar Malaysia (MIM), Hino Motors Sales Malaysia and Handal Indah (Causeway Link) was signed, paving the way for the hybrid bus trial. 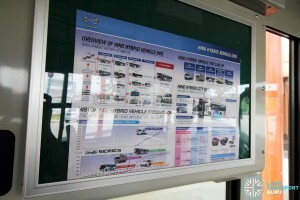 Initially, Mitsui and MIM invited Hino to conduct a trial run of the hybrid bus. 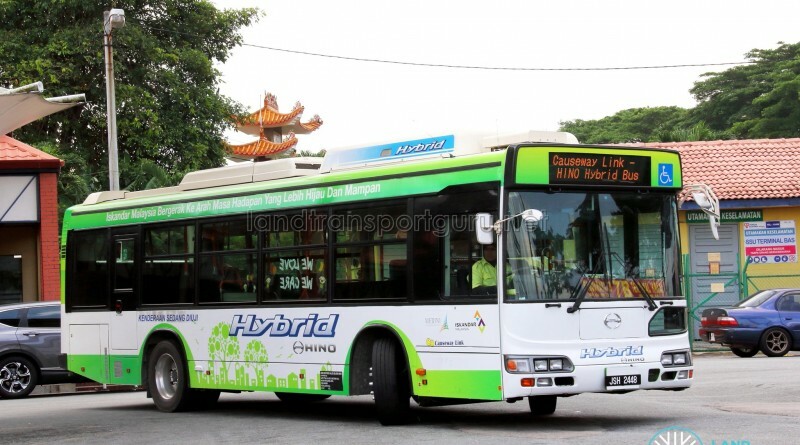 The introduction of hybrid buses and the promotion of public transport are in line with Iskandar Malaysia’s ‘Low Carbon Society Blueprint’ which aims to reduce carbon emissions in Iskandar Malaysia by 58 percent by 2025. 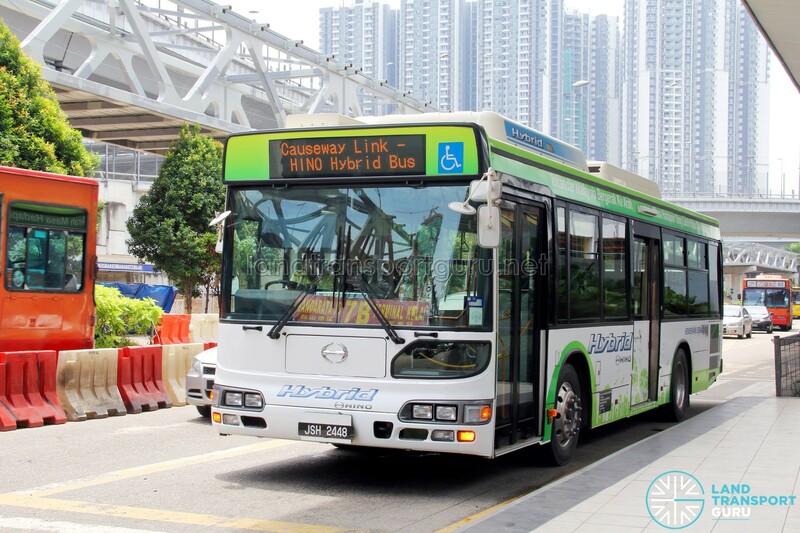 Currently, the ratio of private vehicle users to public transport users is 85:15 for every 100 people in Iskandar Malaysia, and the authorities are hoping to encourage greater public transport usage. After the signing of an MOU between various parties, the Hino Blue Ribbon Hybrid Bus was presented in June 2017 and slated to enter passenger service trials for five months beginning from July 2017 across 6 bus routes. The bus entered service in September 2017 running on the Iskandar Puteri route that connects Larkin Sentral Bus Terminal to Puteri Harbour Ferry Terminal via Medini, registered as JSH2448. 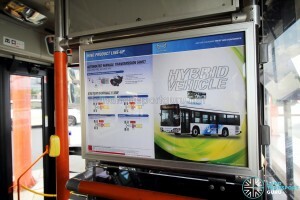 The bus relies on a parallel hybrid system, running on both diesel and electricity. In a parallel hybrid drivetrain, the combustion engine and the electric motor are connected to the transmission independently. Electricity is generated during cruising and regenerative braking and stored in onboard nickel–metal hydride batteries. 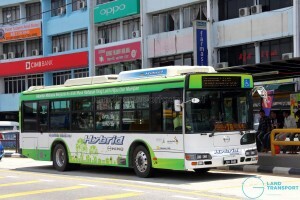 The working principles behind the hybrid drivetrain are similar to that used in the Volvo B5RLE Hybrid, Sunlong SLK6121 Hybrid and Zhongtong LCK6121GHEV hybrid buses previously trialled by bus operators in Singapore. By combining the power output from the engine and electric motor during periods of high energy demand (e.g. while accelerating from stationary or going up hills), less strain is put on the combustion engine, hence lowering fuel consumption and emissions. The hybrid bus is also designed with air suspension for improved ride comfort, and the low-entry chassis offers easy access for passengers. 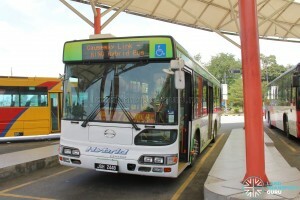 It also has the flexibility for special needs and is able to carry up to 75 passengers. 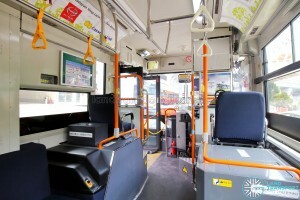 The interior layout is typical of Japanese-spec buses, with large windows and good head clearance up to the rear of the bus. 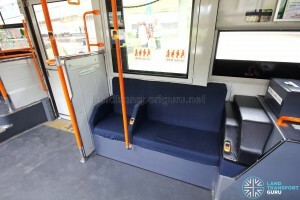 Plush seats are used across the bus for greater passenger comfort. The low-entry design allows for ease of access by the less mobile, accompanied by a wheelchair ramp at the rear door for passengers-in-wheelchair. 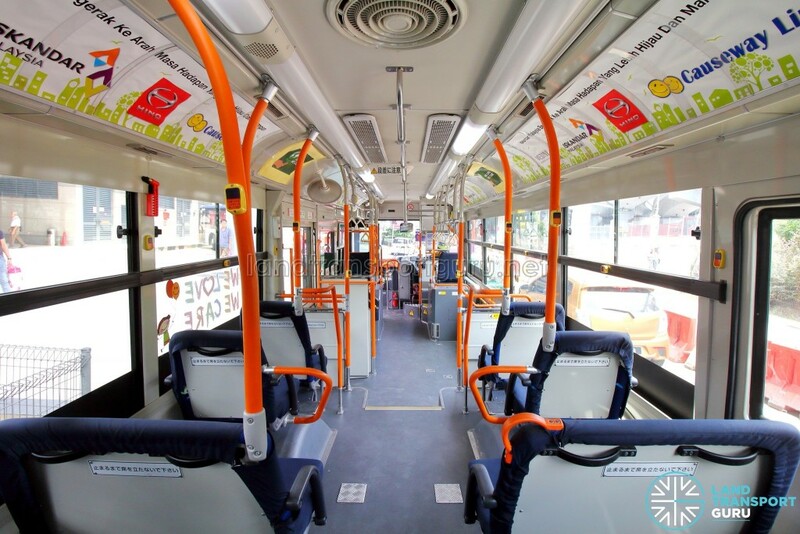 This bus contains a large proportion of single seats for greater standing room, allowing for ease of passenger movement over seating capacity. This particular layout is marketed by Hino as a ‘Rush type’ (ラッシュ型). Other variants offered by Hino have more double seats and a smaller wheelchair bay/standing area. Conventional inward-swinging leaf doors are used for the entrance, and a sliding door for the exit. 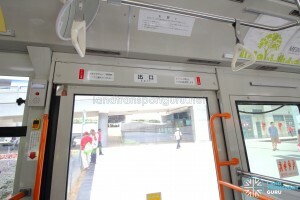 Unique to Japanese specifications, sliding doors are still regularly used for exit doors. Two granny seats are located beside the entrance door. 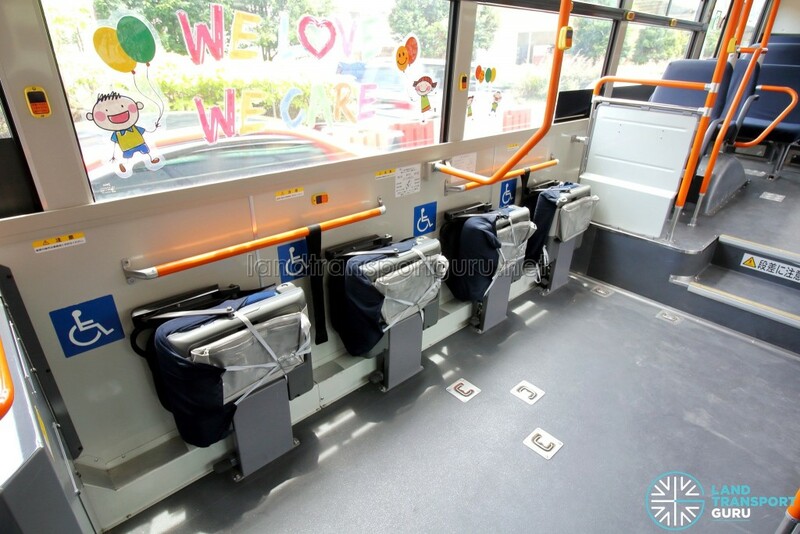 Behind the left granny seat are three side-facing priority seats, reserved for elderly and handicapped passengers, and passengers travelling with young children. 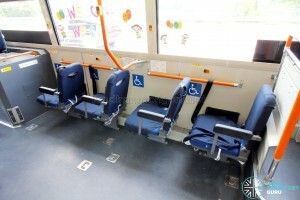 The wheelchair bay opposite the exit door accommodates two passenger-in-wheelchairs (PIW). 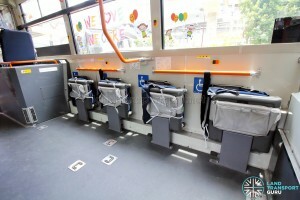 Four foldable seats are installed in the wheelchair bay which can be deployed when no wheelchairs are occupying the bay. 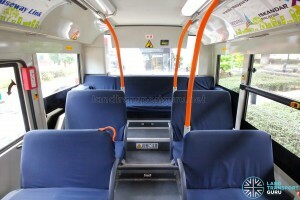 Towards the rear, the bus seats two-abreast for the front two rows and four-abreast the rear two rows. The last row of seats are five-abreast and all seats are front-facing. 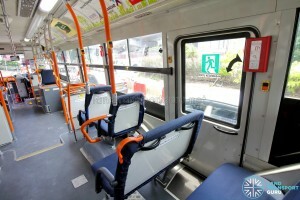 On the right side (offside) of the bus is an emergency exit, beside which is a pair of seats that are able to fold downwards in an emergency to facilitate passenger evacuation. 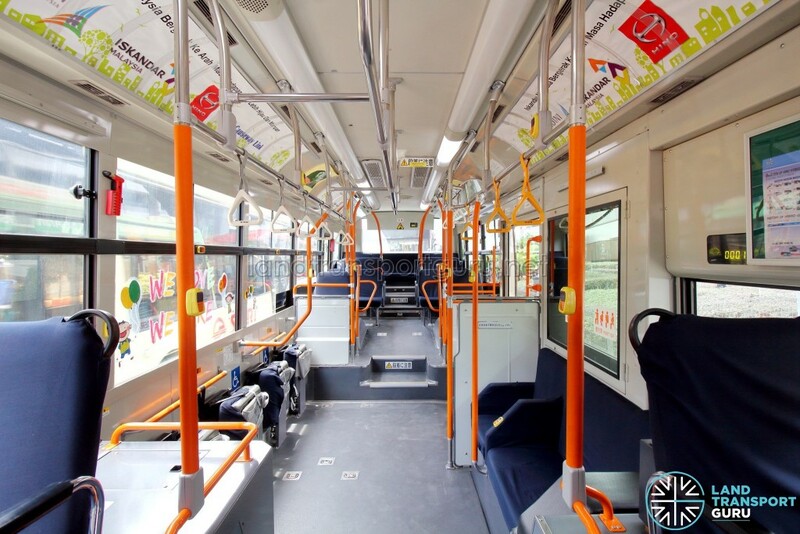 Grab poles are located on both sides of the aisle, All seats also have hand grips to provide commuters with additional support. 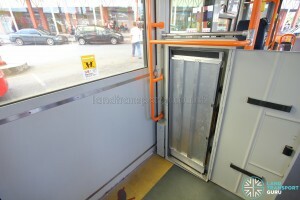 Unique to this bus, stanchion poles are covered in rubber for better grip. The fabric seat covers are secured with elastic bands and velcro strips, and are easily removable for washing. Finally, most windows in this bus have sliding panels on the top for natural ventilation. 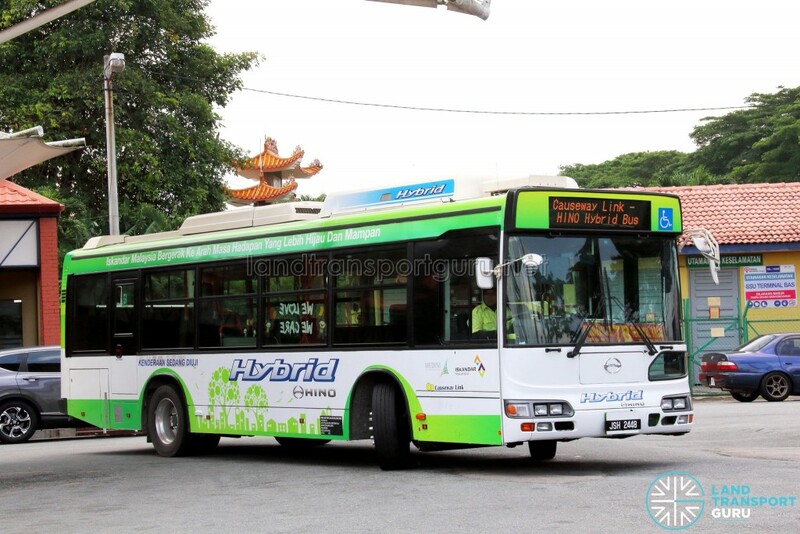 As this particular unit was trialled in Bangkok, Thailand prior to entering service in Malaysia, several labels in the bus are in Thai. 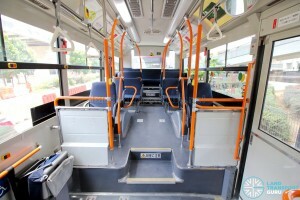 The bus is built exactly to Japanese specifications. 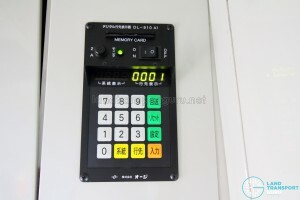 On the front and side, large Electronic Display Signages (EDS) units typical of Japanese-spec buses are used. 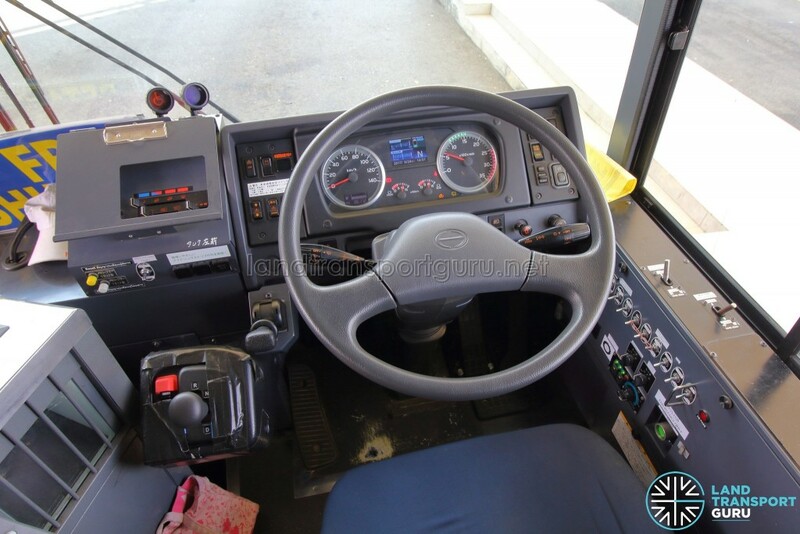 A small viewing window near the front doors gives the bus driver a better view of the kerb while entering a bus stop. 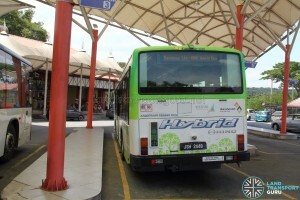 Nickel–metal hydride batteries for the hybrid system are located on the roof of the bus. An interesting feature to note is the LED lamps on top of the exit door, and a door edge sensor mounted on the outside of the rear door. 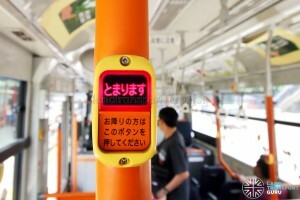 At the rear of the bus, an additional electronic sign on the engine cover displays the Japanese characters “乗降中”, which indicates that the bus is in the midst of boarding and alighting passengers, for the benefit of other motorists who may be temporarily obstructed by the stationary bus. 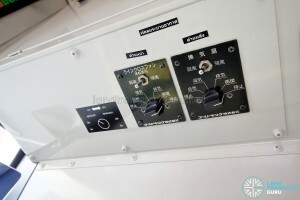 This feature is present in buses built for the Japanese domestic market. The gear stick and handbrake are located on the left of the steering wheel. Door controls are located on the right, with other minor controls on the lower panel. 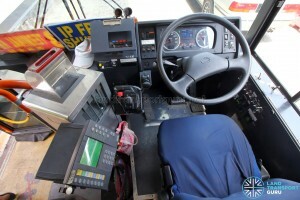 Air-conditioning and electronic display controls are located above the driver’s seat. Built to Japanese specifications, the Hino Blue Ribbon City Hybrid employs a unique wheelchair carrying arrangement where a manual ramp and wheelchair restraint system are stored onboard the bus, to be manually set up by the bus driver during wheelchair boarding and alighting. 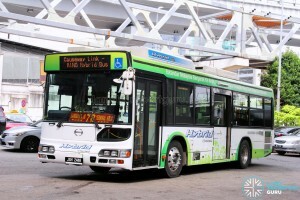 Hino Blue Ribbon City Hybrid – Wheelchair Bay. Notice the mounting brackets on the floor. 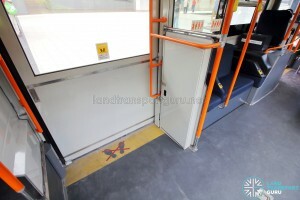 The wheelchair ramp is folded in half and stored in a metal cabinet next to the exit door, which can be manually deployed by the bus driver. 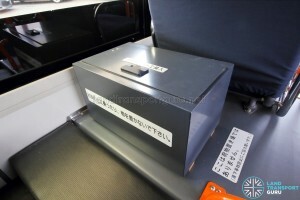 A restraint system comprising of retractable belts are stored in a storage box just behind the front left priority seat. In addition, mounting brackets are provided on the floor of the wheelchair bay for the front-securing or rear-securing of wheelchairs, to be used in tandem with the restraint system to secure the wheelchair in place. Printed instructions for the stowing/deploying of the foldable seats and the securing of the wheelchair using the restraint system are pasted at the wheelchair bay. It exceeds the Euro 6 diesel emission standards, which recently was announced by LTA. Unfortunately I don’t think it will make it to Singapore due to the emissions standard…Hino didn’t submit a bid for LTA’s hybrid bus tender as well.